An appetizer reinvented into a fun, spicy and comforting chowder. 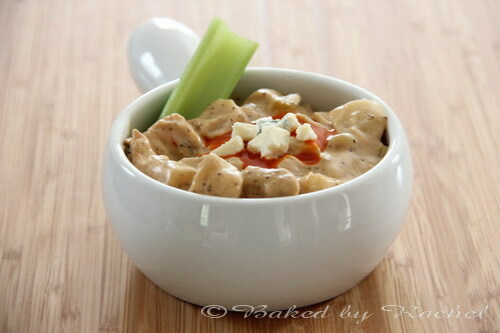 This slow cooker buffalo chicken chowder is loaded with chicken, potatoes and tons flavor. Perfect for cold weather months. I made this before Thanksgiving. A full week to be exact. So I’ve been sitting on this recipe for a bit. Sometimes that happens. If you’re a food blogger you understand, if not… well, it happens more than people like to admit sometimes. We cook ahead of holidays. Days, weeks, sometimes even months ahead. People prepare. Now this isn’t the case here, it’s just that I didn’t want to push this recipe on you before or immediately after Thanksgiving. I hope you’re not sick of chicken and turkey yet. 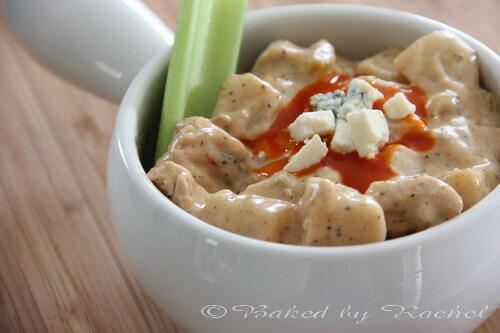 Please don’t say you are because you absolutely need to make this if you like buffalo chicken items. If you do for some awful reason happen to be sick of chicken and turkey at the moment then at the very least bookmark this for later. It’s a perfect easy and fresh slow cooker chowder. A nice updated version with a twist. The twist obviously being the buffalo chicken part. I’ve seen buffalo chicken soups in the past but never chowder so I had to give it a try. I did some playing around creating my own recipe based on ideas from previous chowders and chilis I’ve made. I did some slight tweaking along the way but had a nice base before I started. It was a success. The Mr (the one who loves buffalo anything) loved it. Spicy, comforting, filling and just down right delicious. It smelled great. Let that be a warning to you if you happen to make this while you’re going to be home for the hours it’s cooking! 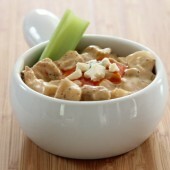 An appetizer reinvented into a fun, spicy and comforting chowder. It's loaded with chicken, potatoes and tons flavor. Perfect for cold weather months. Begin by preparing vegetables: peel and cube potatoes, add to the slow cooker. Chop onion and celery, set aside in a small bowl. Warm a medium skillet over medium heat while trimming and cubing chicken breast into bite size pieces. Add butter or olive oil to skillet. Season chicken with 1/2 tsp celery seed, 1/2 tsp salt and 1 tsp pepper. Cook chicken until no longer pink and heated through. Just before chicken is completely cooked add onion and celery. Cook until onions are translucent and tender. Add chicken and vetegables to the slow cooker. Carefully pour in half and half, chicken broth and buffalo sauce. Gently stir. Remove roughly 1 1/2 cup worth of liquid, add flour to the liquid. Whisk well until smooth. Pour back into the slow cooker. add remaining spices: 1/2 tsp celery seed, 3/4 tsp salt, 1 tsp pepper, ground thyme and red pepper flakes. Stir well. Cover and cook on high for 5 hours or low for 10. Or until potatoes are tender. To thicken, repeat the process used with flour previously: transfer 1 1/2 cup worth of liquid to a small bowl or measuring cup. Add 1 tbsp corn starch. Mix well. Add back to chowder. Repeat with additional liquid and 1 tbsp corn starch. Stir chowder well after adding liquid back in. Divide among bowls. Top off with blue cheese crumbles and a drizzle of buffalo sauce if desired. 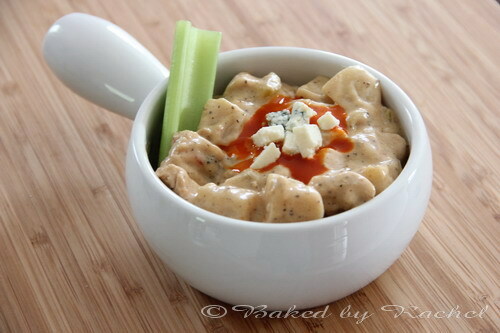 Serve with celery slices.